As the passenger, Jeremy Gutsche, explains on TrendHunter, the eye-popping total came about as result of ordinary internet use — sending emails, uploading documents and such things. 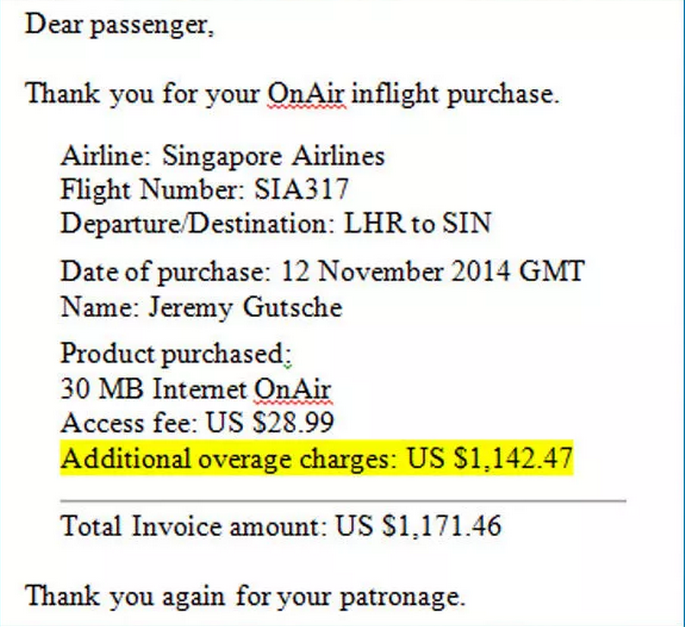 But since the airline’s $28.99 sign-on fee only included a paltry 30 MB of data, the overage charges hit hard. “I wish I could blame an addiction to Netflix or some intellectual documentary that made me $1200 smarter. However, the [company]Singapore Airlines[/company] internet was painfully slow, so videos would be impossible and that means I didn’t get any smarter… except about how to charge a lot of money for stuff. I did learn that,” noted Gutsche. Gutsche also took to Twitter, urging others to retweet as a gesture against price gouging. The airlines so far has only issued a “we’re looking into it” response. @jeremygutsche Thank you for the feedback. Our colleagues are looking into this with our service provider, and they'll get back to you soon. Passengers on Singapore Air and other airlines are unlikely to get serious relief anytime soon, however. For now, the airlines realize they have a monopoly on what is becoming a must-have service, and they are charging accordingly: in my experience flying [company]Virgin America[/company] in recent years, I’ve seen prices double, then triple. Meanwhile, the airlines are locked into long-term exclusive contracts with Wi-Fi providers like [company]Gogo[/company], which appears to have settled a recent price-gouging suit but has failed to bring down prices. The hope of future competition doesn’t look great either, as [company]AT&T[/company] this week said it would ground plans to build in-flight Wi-Fi. Out of fairness to the airlines, though, offering internet at 30,000 feet is no easy task. See my colleague Stacey Higginbotham’s helpful explainer: Why your in-flight Wi-Fi is slow and expensive: It’s all about the pipe. Last weekend, I flew from Sydney to the UK via Dubai on Emirates â€¦ on each flight, customers in economy were offered 10MB free â€¦ with the option to buy another 600MB for USD 1.00 â€¦ yes, only 1 dollar. I just checked my credit card statement, that’s what I was charged. Maybe a test market? Can this world be without internet anywhere…. What’s next, Internet fed to your brain while you sleep? So, although your transaction, concerning airfare. has been totally and absolutely settled, the airline still has access, without notifying you of other charges you may accrue in flight, to your banking account. What other irrational services could they charge you all for? People need to learn how to be a responsible consumer, especially for them who come from the land where they need to have a warning on a hot coffee cup regarding that the coffee is hot. Strange. How did we ever survive flying until just one year ago when there was no internet access during flights? Oh, yes, we were using the (free) on-board entertainment system (which is quite good on Singapor Airlines). And if we had to do some work we were smart enough the store the files on our hard drive or an USB stick. With regard to emails (and phone calls), most Ã¼assengers enjoy the blissfull time of not beimg reachable. this isn’t price gouging. has anyone been to the movies to buy a drink and popcorn lately? This is absurd. When you sign up for wifi, they tell you several times that you will be charged $.10 per additional 100kb after your cap. In addition, you have the ability to be automatically logged off once you hit your cap. In addition, your current usage is basically all over the place. What’s really frustrating is that this guy’s probably going to get enough widespread sympathy thanks to the mob on Twitter, general hatred of airlines, and pity posts like this article, such that he’ll not have to pay what he absolutely, positively owes. Instead of collecting more details , Author is getting upset over high price and then the usual complain is why airline should charge so much? No mention of internet usage, no mention of the rate? Even if it is a clear mistake from Airline , I would be interested in knowing what information do they provide to customer who want to use their internet. Also I don’t see option of up-vote without logging in , but I can comment without having an account. Can’t agree. Just flew to Dubai with Emirates and payed $1 for up to 600 MB! (the first 10 MB were free)! And they are using OnAir as well! Internet was not very fast but okay to communicat through WhatsApp and email and surf the web. Hello, I flew Singapore Airlines a couple of weeks ago from AKL-SIN. I used the Internet. I kept the page open the whole flight that allows you to monitor your usage. I also read the FAQs on how to manage my sessions. There is heaps of information on there….There is no way he could have not known about this! Pay the bill Jeremy! 1. Was he informed of the $/MB overage rate when he signed in? 2. How much did he actually use? If the answer to 1 is yes, and the answer to 2, minus the included 30MB, times the overage rate, equals to $1140, then there’s no grounds for complaint here. Thanks for your comment, Bob, but don’t you think your response is a bit harsh? I agree that people have responsibility for what they sign up for but, given the monopoly situation, and the staggering rates, I think Singapore Airlines should have capped the bill at a certain amount (or at least provided a better warning). Yes, lets hold everyones hand all the time. .
Umm, well, the short answer is to just not use the service. I think cell phone data rates are too high so I don’t use them. Should I also complain about a bill that I don’t like, if I were to use it, as well? If you know what the rates are and your usage it correct it is your own fault. They can charge $100/meg if they want to. I agree whole heartedly with you Bob. Personal responsibility seems to be at an all time low these days and I find the #1 reason is that people refuse to read. That makes pricing impractical on a typical laptop. Say you saved a document which is hosted in your dropbox and missed the “syncing” icon at the top just eating your savings away. Worse, say the auto-update feature of your OS “decided” to auto download the latest multi-gigabyte OS patch. Most people don’t even know how to display their data usage on their machine let alone understand how to control it properly (besides the obvious of don’t stream video). Personal responsibility requires transparency and data visibility which isn’t the case here. Unlike airtime, data usage isn’t something we can consciously throttle. A typical computer and cell phone can send a lot of data without us being aware of (e.g. google+/dropbox on our phones uploading our photos etc.). Cell phones have some basic limits here but they assume all wifi is free.